Hello again! Yeah, here I am again, filling the Matrix with fresh information about the upcoming Shadowrun: Hostile Takeover. Last time we looked at the employees that the players will be bringing on board to fulfill their grandiose machinations; in this installment of my designer’s blog we are going to look at exactly what those employees—specifically the shadowrunners—will be doing to achieve dominance of Seattle. Other than specialized victory conditions unique to each megacorporation, which we will look at in closer detail soon enough, Hostile Takeover is won through the accumulation of Influence. Influence comes in many forms; money, power, control… all the things that any good megacorp needs to wrap its fingers around the throat of a city. The very heart of the game revolves around the acquisition, expenditure and accumulation of the Influence resource. This is primarily done through the completion of two very different types of assets for a megacorp, Missions and Schemes. During each game turn, players will have their chance to add Missions to their megacorp’s queue for later completion. Whether drawn at random from the Mission Deck or chosen specifically from previously discarded Missions on the Message Boards (a cool place to toss discarded Missions for others to potentially take up), megacorps send their shadowrunner teams to go and complete a variety of tasks. Missions are broken down into three different categories of tasks; Conflict, Matrix and High Society. Each Mission can be completed in two different ways based on what type of Mission it is. Conflict Missions use combat skills and brute force to accomplish, Matrix Missions use hacking and technomancy, and High Society Missions are undertaken with words, drinks and general schmoozing. Things don’t always go as planned for shadowrunners, so each Mission has an alternative method on how to fulfil them. Sometimes your ‘runners don’t have enough bullets and might have to just talk their way out of an early grave, after all. Succeeding at Missions earn the megacorps Influence, adjusts public opinion, and can have several other cool effects. Whether your teams are setting fires in the Barrens, putting on Rocker parties at the Lucas, or running guns for the NAN, Missions accomplish this in your megacorp’s name. Megacorps can play nice and just look out for themselves, but that rarely pans out in the world of Shadowrun. When a player wants to knock his opponents down a peg, they send their shadowrunner teams out on Schemes. These types of cards come in two forms; Active and Counter Intel. Both are drawn at random from the Scheme Deck, but they do drastically different things. Active Schemes are effectively like Missions, except they target an opposing megacorp directly. Assassinations of corporate assets, underhanded smear campaigns, or downright direct theft of resources can be found within Schemes, and more. Counter Intel is a completely different matter. They are Scheme cards that held back to use as interrupting reactions to specific game instances. When things look bleak in a Conflict Mission, call in an Ork Ganger Ambush for help. Want to screw over the Aztechnology player? Throw a huge PR party making them look like knights in shining armor. Tired of your opponent gaining Influence from the Alabaster Maiden each turn? Burn it down. That is the sort of things Schemes will do for you. Oy, chummers! Guess what time it is? Time for Mister Steele to tell you a little bit more about Shadowrun: Hostile Takeover! When last we met, I had told you the general idea behind the game—become a megacorporation and take over the city of Seattle by any means necessary. This time around, let’s look at who is going to be actually turning the wheels and manipulating the pieces of the puzzle. First off are the Figureheads. Each player gets two of these pawns, both literal and narrative, to represent their influential agents driving, flying and sneaking around the city. The Figureheads travel to and from iconic Shadowrun Seattle locations from the roaring Renraku Omnidome to the smoky atmosphere of Dante’s Inferno. While visiting these locations the Figurehead spreads their megacorporation’s money and influence around town, vying for control over the locations themselves as well as recruiting shadowrunners and hiring Wage Slaves. Controlling map locations is a key element to the game itself. This is measured by a limited number of Territory Tokens that each player has to spread around; where they have the most tokens they have the most control. Figureheads will be zooming around the board wining, dining and bribing the city of Seattle in order for their megacorporation to create and maintain a stranglehold upon it. Some locations will be more important than others, and players will quickly decide what Influence battles are worth waging—or whose side to back in battles already waging. While they are planting their figurative flags in the real estate, megacorporations will begin to put together their plans and the teams to complete them. 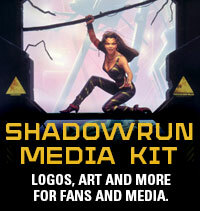 Shadowrunners from all walks of the trade can be hired on to be part of their machinations. 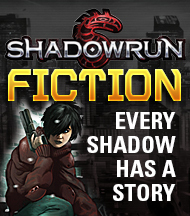 The shadowrunners are drawn from a deck of many different personalities; some of which Shadowrun fans will recognize. Putting teams together with the likes of Rigger X and Ethernaut along with new faces like Aargh and Twitch, important Missions can be undertaken to gain power and resources—or vicious Schemes can knock down the competition a peg or three. We’ll talk more on Missions and Schemes in a future blogpost, but rest assured they are a HUGE part of Hostile Takeover. If Shadowrunners are the tools with which a megacorp manipulates the world, Wage Slaves are the furnishings of the home and the armor it wears for protection. Hiring on a staff of “regular” agents like Mister Johnsons, Security staff and even putting the Mayor on the payroll adjusts the megacorporation itself. They help keep the megacorp safe from outside attack, but also grant special benefits like additional movement for Figureheads, more control over who goes when, and the number of employees a team can have. While not as necessary as a Shadowrunner team to take over Seattle, trying to do so without Wage Slaves would be a helluva uphill climb. So basically, while you are moving your Figureheads around the map trying to build a powerbase, your opponents are going to do the same. You know what they say about big fish in a small pond… well, in Hostile Takeover, you are all going to be sharks. Your Shadowrunners, Wage Slaves and all the things they do for you will your teeth. Next time, maybe we’ll look at exactly how you will be taking bites out of the city—and each other! When I got the news that I would be creating the first big Shadowrun-themed board game, I was ecstatic. Shadowrun and I have a long relationship from decades of being a gamer, and my local gaming crew has run RPGs off and on over the course of its existence. Getting the chance to create a milestone event like Hostile Takeover is not only my pleasure, but also truly an honor. Off went the gamer’s hat and it was replaced by the designer’s cap. Hostile Takeover needed to be epic in feel and execution. Not a game about individual runners sneaking around in the shadows and alleyways, like what happens in the roleplaying game; instead this needed to be a game from the other side of the plot—the megacorporations. This was going to be a game where players were the ones doing all the string pulling, but without losing any of the gritty feel of sketchy missions, random violence, and constant under-the-table double crossing that a good Shadowrun game should have! That in mind, the initial designs for Hostile Takeover began to take shape. I knew the game needed to be set in Shadowrun’s iconic Seattle in the 2070s, which gave me a solidly defined base of information to build off of. The map has already been drawn, the megacorporations have already been laid out, and much of the cast of supporting roles exist in the thousands of pages that have been previously written. All we had to do was put all of this together in a fun, exciting game of manipulation and scheming for three to six players. Many of the best board games in the market combine resource management, a little bit of luck, and oftentimes a set limit on game turns or play time. Mixing all of these things into one game plan, Hostile Takeover will not only require players to think their strategies several turns in advance but also be ready to adapt when the hidden card draws and dice rolls throw unavoidable monkeywrenches—and monkeywrenchers—into the works. 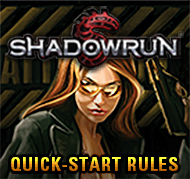 As the game starts to take shape on the designer table, I decided I wanted three major elements in the game to give it the Shadowrun feel: shadowrunners accomplishing missions, players negotiating and manipulating each other for fun and profit, and the potential for an underhanded snatching away of victory from their opponents. The game should have all of these things … and more. The rough draft of the game started to take form as a badly photoshopped map of Shadowrun’s Seattle, a growing list of shadowrunners, and twelve megacorporation statistic cards to represent who will be hiring them. While the next chapter in Hostile Takeover’s Designer Blog will share a bit more light on how the game is evolving into what I hope will be a fan favorite, I think a great way to close out this segment is with the current list of the megacorporations (you never know what’s going to happen between now, final play testing, development and production) that players of Hostile Takeover will be using to vie for dominance of Seattle: Ares, Aztechnology, Evo, Horizon, Mitsuhama, NeoNET, Regency Megamedia, Saeder-Krupp, Shiawase, Telestrian Industries, Universal Omnitech, and Wuxing! See you around chummers! Stay tuned for more on this game as it evolves!